Amber and Bryon married at the Four Seasons Resort at Walt Disney World in Orlando Florida. With an award winning team of vendors the couple created a beautiful evening of ceremony and reception that dazzled their family and friends. Annie with the Soiree Company took the bull by the horns and did an incredible job of putting together a beautiful vision for the couple’s ceremony and reception. From the LED dance from from Get Lit to the beautiful draping from Swag Decor that accented the wall behind the couple, even the lighting by Fyerfly Productions gave a unique texture to the walls and ceiling of the ballroom. Scott Messina provided the DJ services and microphones for the ceremony and the reception. The music was awesome and professionally presented. Lowe and Behold did an exceptional job on creating the Amazing florals for the ceremony and the reception. From the table top decorations to the brides white orchid bouquet to the huge arch covered in white hydrangeas and lavender roses, they made it look stunning. Dogwood Blossom crafted beautiful mirrored sign and seating cards to keep the guests organized and going where they needed to be. KV Photography came and spent the entire day with the couple of their families, photographing every aspect of the wedding day. From getting ready shots and the walk down the aisle to the ceremony shots and the sparkulars by Paper and Vapor Events going off during their first kiss, KV Photography got it all. They also worked in tandem with 5801 Weddings who captured the day on video for the couple to relive over and over again. Yet, now, I can only express how I feel. You are everything that makes me happy, just because you are you. I am forever grateful that God allowed us to Be. You will forever and always be, my other half…. and nothing has ever felt more right. I have always found it somewhat difficult to describe the true feeling of love, but as t he days, months and years go by with Amber, I find it easier and easier to put into words why I love her. I love her because nobody has ever given me the love that she has given me and I know in my heart that she is the only one that could ever love me this way. I love her because a long time ago she made me smile when I had forgotten how to. I love her because she makes me feel like I can accomplish anything that I pursue. I love her because she knows me better than anyone on this planet. Whenever I have a bad day, she knows it without me even saying a word about it and she does everything to put a smile back on my face. I love her because she accepts me for who and what I am and would never try to change me into someone I am not. I love Amber because she makes me look forward to the next day with her. I will never stop falling in love with her and there is no one else I would rather experience life and walk the earth with. It was an amazing night! 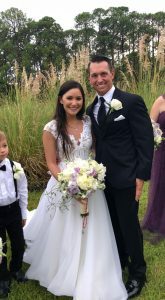 Congratulations to Mr. and Mrs. Burk!! !